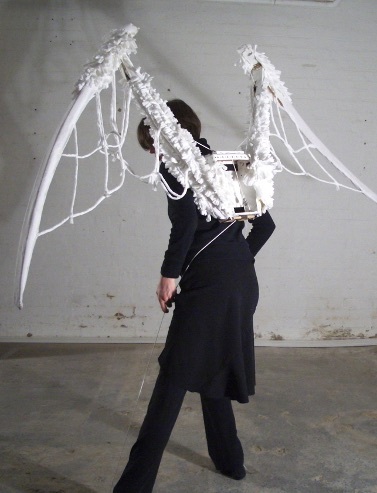 These wings can be worn on the back and are operated by means of strings attached to the ankles so that they move as you walk. Materials used include mop heads, fabric, wood, cord and pulleys. Created in 2005, they have since been used by Cupid at Spitalfields Market (an event by Eudemonic), and in a collaboration with performance artist Tessa Wills entitled Experimental Anatomy Part 1. This was a durational performance in a shop window (The Old Clock Shop) as part of Brighton Festival in 2005. The performance follows Tessa’s attempts to learn how to fly.